I bought some flowers today from Monet's Garden in Northcote Plaza, but, I forgot to ask what they were. I don't know anything about flowers. As usual, I first covered the panel with Raw Umber and started to put highlights by using a rag. Greg told me not to do it too much, and move on to putting some colours early. I put Burn Sienna on the area of yellow flowers, a paper wrap and a box as a base colour. That was Greg's question to me, and I got it right! 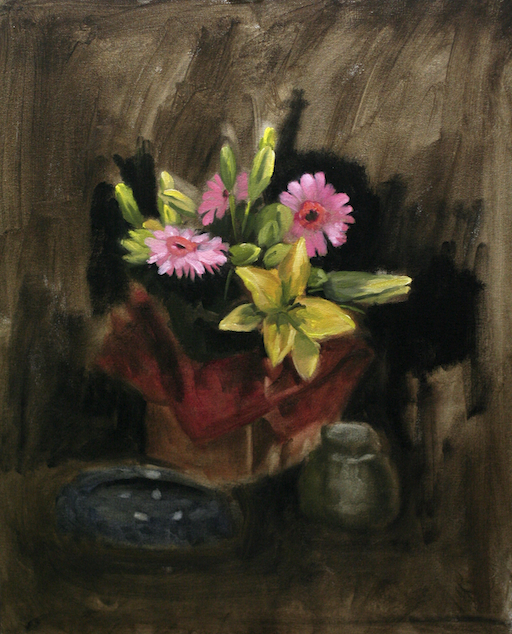 Pinkish flower is a mixture of White, Alizarin and a touch of Cad Red. Yellow flower is White, Lemon Yellow and a touch of Burnt Sienna. By the way, because of the arrangement, Greg suggested to put it on the floor, and he put some porcelain props next to it, and it really worked. He showed me how to do petals, and it was really amazing to see how simply and quickly the forms started to appear. I'm reasonably happy with this one so far.